ROME (heinnews) – Paul Eboua wows you first with his physical tools. The Stellazzurra Basketball Academy Rome forward is 2.00m (6-foot-7) and stretches out his impressive 2.22m (7-foot-3) wingspan. Then you look at his game and see a lot of potential as a long term wing. And then you learn that Eboua only started playing basketball seriously in the summer of 2015 and it all gets more interesting. Eboua, who only turned 17 on February 15, was born in the Cameroon capital Yaounde and grew up in Douala – the country’s largest city. He arrived in Rome in the summer of 2015 when Stellazzurra brought him over to Italy into their academy. “I moved to Rome because Stellazzurra wanted me to play basketball. So, my life was changed,” Eboua said. Eboua left the northern Central African country with an older brother and two younger sisters back home. And it was a series of firsts to come. One of the keys to Eboua getting through the move was fellow Cameroonian Jordan Philippe Bayehe, who is also with Stellazzurra. Eboua said he spoke with Bayehe in Cameroon before coming to Italy after Bayehe had already been to Stellazzurra on a trying. He said things have been so much easier with Bayehe around. He has enjoyed his time in Rome thus far. Eboua said he only learned about basketball about a year before coming to Italy. He said he was practicing only about five or six times a month – a drastic change to Rome where he started practicing twice a day. “I started to finally see real basketball with other teammates, opponents and teamwork etc,” said Eboua. Giacomo Rossi, the sports director of Stellazzurra said Eboua is coming along excellently off the court. Of course there are areas for Eboua to improve on the court. “I think the next step is to be more concentrated during the game,” Rossi said. “He received a good basketball from god but here he has worked very well on his coordination and nutritionism in the last two years. Stellazzurra play a lot of international tournaments, which give Eboua a chance to face off against many of the best teams and players in Europe. “When I play in this kind of tournament, I am trying to understand at what level I am. 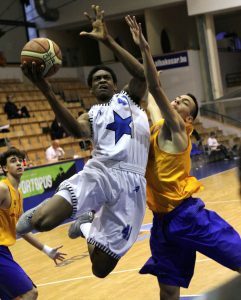 For sure, I see that I need to run and jump more than my expectations,” said Eboua, who is expected to be one of Stellazzurra’s leaders at the up-coming Adidas Next Generation Tournament in Belgrade. Another big event for Eboua was the 2016 Jordan Brand Classic international team in Brooklyn. “Amazing experience. I saw a lot of good players who were a lot better than me,” said Eboua, who collected 2 points, 4 rebounds, 2 assists, 1 steal and 1 block in the game. Eboua also said he loves watching his fellow Cameroonian Joel Emiid. “Embiid is a very amazing player. I’m sure that he will be one of the best players in all of the NBA,” Eboua said. The talented youngster also said he would love to play for his native Cameroon one day.